Have you ever thought of Colombia as a hiking destination? We must admit, that we haven't. It has always been other South American countries who drew our attention when it came to trekking. Luckily, we came across Los Nevados National Natural Park, and since the very beginning, we were fascinated by Paramo, the unique ecosystem scattered throughout South and Central America, but the majority of the Paramo ecosystem can be found right here, in Colombia. Let's find out more about the best hike in Colombia and explore this South American country from a different perspective. The Los Nevados National Park lies in the coffee-growing region in Colombia, centered around snow-capped volcanic peaks. The park features very special and unique flora and fauna, and although the northern part of the park is at the moment closed for public and not accessible for hiking because of volcanic activity of Nevado del Ruiz (how deadly this volcano can be was proved by an eruption in 1985 that killed 22,000 people), there is still an extensive area where travelers can go and satisfy their hiking needs. Do you want to get a sneak peek at the stunning stretches of Colombian Andes? Just come to Los Nevados National Park. There is a reason, why Los Nevados belongs among the most visited national parks in Colombia. Apart from the Paramo ecosystem growing in particular in the Colombian Andes including beautiful native plants known as frailejones (Espeletia), you can find here volcanic peaks, lakes and glaciers. We would especially emphasize the presence of glaciers here because, in the past few years, glaciers in Colombia were receding incredibly quickly, and this trend, unfortunately, continues. Glaciers in Los Nevados National Park and overall in the whole of Colombia are particularly vulnerable to climate changes, and scientists predicted that Colombian glaciers would melt by 2048. Because of those pessimistic predictions, you should consider visiting the park in the near future, before all glaciers will melt. Even now glaciers are something rare to see in Colombia. During our time in Los Nevados, we climbed the Nevado Santa Isabel, one of the last tropical glaciers in the world, and our guide informed us, that this particular glacier receded about 80% in the past 30 years which is really crazy number and it always makes us think what we can do better to save the nature for future generations. If the trend continues, there will be no glacier on Nevado Santa Isabel volcano in 5 to 10 years. You can find rare animals in the park such as spectacled bear, cougar, tiger cat or mountain tapir but they are hiding deep in the forest or far away from people, and it would be more than exceptional to spot them with your own eyes. There are also many different species of birds in the park such as indigo-winged parrot, rufous-fronted parakeet, chestnut wood quail and we were incredibly lucky to spot two Andean condors, the largest flying birds in the world, and several black-and-chestnut eagles. So you arrived in Salento, Manizales or to another part of Colombia for example to El Cocuy National Park and you hear the term Paramo all over again, but don't know what exactly does it mean, what should you expect to see, what is all the fuss about and why everyone in the area is so keen to show the Paramo to you? Before we start with hollow and empty phrases, we must forego that Paramo is cool and if you've never seen it before, Los Nevados National Park is for sure the place, where to fall in love with this strange but beautiful mountainous vegetation. In official language, Paramo is the ecosystem of the regions above the continuous forest line, but below the permanent snowline. As per this definition, it is clear that the Paramo vegetation grows high in the mountains and is composed of huge grasses, shrubs, and frailejones, the typical high-altitude plants (from 2000 to 4500 meters) who belongs to the sunflower family and forms the unique appearance of Paramo ecosystem. There are four official access routes to Los Nevados National Park, but the most of all visitors reach the park via city Manizales, Pereira or smaller town Salento on the other side (through Valle de Cocora). There is probably no better or worse access point (but some of the roads involve spending several hours on the bumpy roads, and by this word, we mean real bone-breaking journey), it only depends on your hiking plans. Do not forget that there is no public transportation going directly to the park, so you will need to either book a tour, contract a private transport or arrive in Salento, from where it is easier to take a frequent jeep to Valle de Cocora, from where you can start your trek. Los Nevados National Park is accessible all-year-round, and the weather doesn't change that much throughout the year. Driest and brightest months are January and February, but having said that, the weather in the mountains and especially in Paramo ecosystem is unpredictable, and during multi-day hiking, you will most likely experience sunny periods followed by scattered showers, fog and thick clouds rolling over the hills which altogether creates an unforgettable atmosphere. During our trek in mid-August, we experienced a bit of everything (except snow), so come prepared. 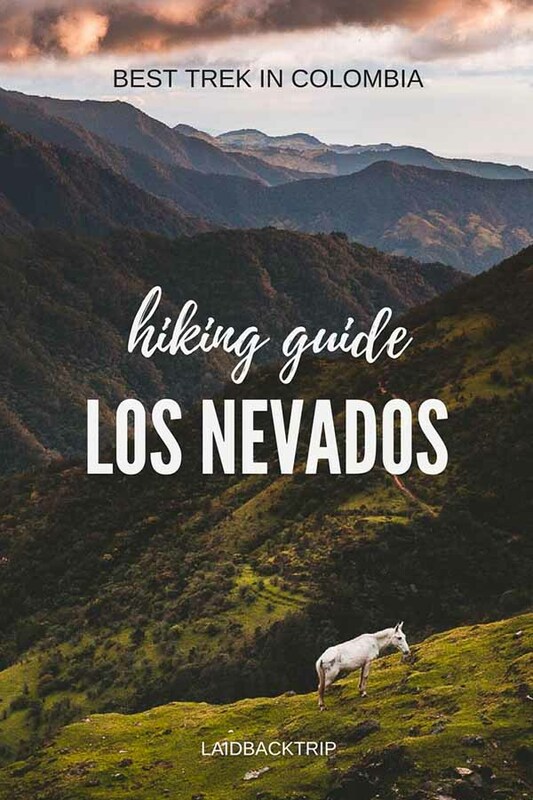 There are numerous hiking and trekking trails in Los Nevados National Park, and the choice of the right one depends only on the time you have and on your level of fitness. 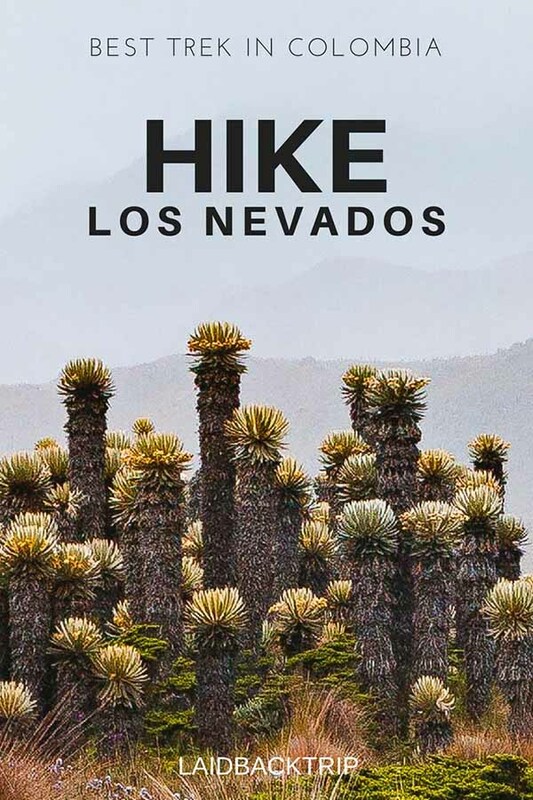 Some hikes can be accomplished in one day (if you choose a one day hike, check the elevation first because of the risk of altitude sickness), but it is more common to spend in Los Nevados at least one night, not only to enjoy the scenery but also to connect with locals living on the farms further in the park. Most of the hikes (usually overnight ones) can be done only with an authorized guide and after registering in visitor's book. There are several offices in the park where you have to pay the entrance fee - we did our registration in Potosi. The price to enter the park is COP 53 000 per person (usually included in the tour rate). IS ONE DAY IN LOS NEVADOS NATIONAL PARK ENOUGH? After we did a four-day three-night trek, we would shortly say NO. Of course, if you don't have spare time, if you are well-trained for trekking in high elevation or if you think that getting just a quick glimpse into the Paramo ecosystem is enough, even one day is ok - better than nothing for sure, but to get the real connection with the specific nature inside the park, you'll need more than a day. If you read our blog regularly, you probably noticed that we are into hiking and more importantly, into independent hiking. We usually avoid organized tours, because we prefer to take our time, sometimes wait for the right light for a picture for too long, eat when we want and walk as fast (or slow) as we need at that time. But there are places, where an organized tour is a must. There are many reasons why sometimes it not allowed to venture on your own - to name a few it can be official park's regulation, visitors' safety or the help with navigation through the park where there is lack of markings. In Los Nevados National Park, it is the combination of all three reasons mentioned above. Also, the weather can change in a second and a sunny day can turn into windy and foggy one with low visibility, and it is easy to lose orientation and eventually go off course. Shortly, it is officially compulsory to have a guide, and when we travel, we want to enjoy our trip instead of breaking the rules and having problems. Because of the exceptional combination of Paramo ecosystem, volcanoes, glaciers and mountains, we decided that only one day is not enough for us and that's why we were seeking for agencies providing multi-day hikes from Salento, a town in our itinerary. After thorough research, the choice fell on Paramo Trek, a trusted company with an exceptional rating on Tripadvisor who advertised that their staff speaks Spanish and English and they also had a wide selection of multi-day treks. We arrived in Salento a few days before the trek, and to be honest we started to feel a bit nervous. First of all, we sometimes find online reviews misleading, second off all, because we chose four-days three-nights trek with a climb to Nevado Santa Isabel where it was needed to use crampons and axes (first time for us), we felt anxiety about the quality of equipment provided. Thankfully, everyone, we spoke with before the trek (in Salento or Manizales) and mentioned what we are up to in connection with the Paramo Trek, they told us we couldn't have chosen a better agency because they are the best when it comes to experience and organization, so it calmed us down and we started to believe that we are in good hands and that we will enjoy our trip. You should choose a trek according to your previous experience, level of fitness and expectations. No experienced guide will take you to the park if he has doubts about your physical ability, a good one will always recommend you an option which will suit you well, and you will enjoy the trek much better. If you are still in the dark and have no idea what trek to choose, do not hesitate to contact the agency and they will gladly recommend an option for you. It is good to know, that from Salento, you won't be able to get into the park only in one day. If you see a one day trip, it is most likely to the Valle de Cocora (stunning though) where the national tree of Colombia - wax palms - grow, and you will climb hills around (it is possible to do on own). A two-day trek will take you to Paramo ecosystem, while during the three or four days trek you can further explore Paramillo Quindio, Nevado del Tolima or Nevado Santa Isabel. It is possible to get to the park in one day from Manizales, but what we see as an obstacle is the inadequate time for acclimatization. We did four-days three-nights trek (approximately 50 km) with a long name Conquistando La Doncella Blanca Cima de Nevado Santa Isabel Trek, and we can only recommend this one. Not only that nature was stunning, we did the glacier climb, and saw Paramo ecosystem for the first time, but we could also stay at the farmer's houses and could've observed how farmers in remote corners of Colombia live. There is no hotel in the proper sense of the word in Los Nevados. You can stay at farmer's houses (in very basic dormitories) who are scattered throughout the park or in the tent on the farmer's land. The accommodation is simple, but after all day hiking, we found there everything we needed. A bed, blankets, toilet, shower (mostly cold) and warm kitchen, where were also served meals. During our hike, we stayed at farms La Argentina and El Berlin, beautifully set family-run farms, where we could feel the real connection with local people who were incredibly friendly, and we were glad they let us spend an afternoon and night in their home. The last night we stayed in a place called Potosi, and because it is connected with Manizales and Pereira by road, it was more like a hostel, but amenities were surprisingly more basic, and the vibe was less cozy and the feeling less authentic than on the other farms. We had the accommodation arranged by Paramo Trek so our only focus every day was to get from point A to the point B, and we did not have to stress about reservations and places to stay at all. It might be possible to call and make a reservation (if the reception is available and when you'll be able to get the number). We believe, that if you show up without reservation, there is always a mattress or spot on the floor free, but the accommodation part was where we found having an organized tour particularly helpful. All food and drinks (coffee, tea, water) were included during our trek and, to be honest, it was of better quality and taste than we've experienced in Colombia so far. We always had breakfast and dinner in our accommodation and we could only admire ladies running farms, how they were able to cook for ten or more people in the limited space, and in very basic kitchens. Breakfast in the mountains usually contains scrambled eggs, arepas, cheese or rice and for dinner, we had rice, a piece of meat, fried bananas, and potatoes. Hot drinks are available as well, you can ask for a coffee, tea, aguapanela (terribly sweet drink made from sugar cane) or tea from coca leaves which helps travelers to tolerate the altitude better. Can you imagine a better way how to start a day than with a delicious slice of homemade cheese? On the first day, the guys from Paramo Trek gave us bags with snacks (a mix of sweet and salty treats) which came particularly helpful when we needed quickly replenish energy during the trek. Snacks were the only food we had to carry. We always had lunch on the trail, and we were surprised what our guides brought for us. It is necessary to treat water, take with you a filter or water purification drops if you go on own. Our guides had a filter and always made sure we had enough water for the whole day. Do not underestimate it as staying hydrated is more or less the most important rule when hiking at high elevations. We always carried at least 2 liters per person per day. The weather conditions in Los Nevados can be different every day. Be prepared for the hot and dry weather as well as for rain and cold. You will need long and short-sleeved t-shirts, trousers, rain trousers, leggings, head torch, hat (sun hat and warm hat), gloves, sturdy hiking shoes, sneakers, socks, underwear, rain and wind-proof jacket, fleece jacket, hoodie, sunglasses, sunscreen, personal hygiene, gaiters, dry clothes to wear on the farm, sleeping bag (there are blankets on farms) or cocoon and hiking poles. In case you arrived in Colombia just for your holiday or you are traveling long term and don't have all the equipment needed (same as we didn't have), do not fall in despair, you can borrow clothes for no additional charge in Paramo Trek office, also, they will provide you with equipment for glacier climb. When we traveled in Southeast Asia and did some tours, we remember that the quality of equipment borrowed (for example bikes or snorkeling gear) were sometimes really lousy quality. Not here. We had to borrow hats, rain trousers, and warm gloves and everything was like new, and to be honest, hiking poles we all got were of much better quality we have back at home. Traveler's safety is taken very seriously here the equipment was only the beginning. It was five of us in our group, and we had two guides with us (there is a rule at least one guide per 4 clients). Also, when we climbed up the Santa Isabel glacier, the weather was quite bad, and at the end of the hike, the visibility was pretty low. When we were about 50 meters below the peak, and the climb was getting more technical, our guides decided to finish here and didn't take any risks. It was when the severe weather, the tiredness from long trek and altitude started to show up on every participant of the trek. I think I can speak for everybody, that members of our group did not mind at all. Firstly, for all of us, it was the first experience with glacier climb, so we were exhausted and happy that we made it and secondly, there were no better views waiting for us at the top. We appreciated this decision, although it meant we did not conquer the volcano in the proper sense of the word. We don't take it for granted that traveler's safety goes first as sometimes, we had a feeling that guides (probably pushed by the agency) have a feeling that clients paid for something and they have to provide them with the service no matter what, but here, we truly liked that common sense and safety took precedence over adventure and unnecessary risk. Get inspired by the hike we did in Los Nevados National Park. We chose the four-days three-nights trek starting in Salento and finishing in Manizales. The beginning and ending destinations are perfect because we believe that the most of travelers have Salento (coffee farms, Valle de Cocora with wax palms) in their itinerary and the end in Manizales is also handy because there are many buses connecting the city with other popular destinations. When in Salento, we had to stop by in Paramo Trek office one day before the trek started. It is compulsory not only to get more detailed information about the trek, but the staff in the office will also go through the checklist and make sure that you have everything needed or that they have the equipment to borrow. We also appreciated that we could meet our guides in advance and made sure we are on the same page. The Day D started again early in the morning in Paramo Trek office, where we met other three clients, did the last equipment check, got our snacks for the whole length of the trek and packed lunch for the first day. After that, we walked to a nice restaurant in Salento called Brunch, where we had a hearty breakfast and got to know our partners in crime for the next four days better. Right after breakfast, we jumped on jeeps waiting for us in front of the restaurant, and we headed to Valle de Cocora, a unique place where the national trees of Colombia, wax palms grow. From here, we started our trek with a climb through a forest with scattered views of the valley. After lunch, we continued our steady ascend until after about 10 km we reached our destination, farmhouse La Argentina at an altitude of 3450 meters. We accommodated ourselves, had a short break and got used to a presence of animals (cows, dogs, cats, horses, pigs, hens), literally just behind our door. Then we decided to take a short walk to the river bank, now without backpacks. There we sat for a while and just looked around and listened to the silence. When we came back, we gathered around the stove and waited for delicious dinner and went to bed right after. Does anyone usually bring you a hot drink to the bed right after you wake up? Well here, in Los Nevados, we got just that, and it was a perfect start of the day. Thanks, guys! After a typical breakfast, we were ready to set off. From farm La Argentina, we climbed to an abandoned farm called Buenos Aires. It is a farm where the family from La Argentina used to live before, but they moved to be closer to Salento a few years ago. From there, we continued on the ascent, and for the first time, we could admire the Paramo. To be honest, it was much bigger than we expected, and after we were given information, that those fragile plants grow only 1 cm per year (and some of them were up to 5 meters tall! ), we really could appreciate the uniqueness of this place. When we had lunch, it began to rain, but luckily, we could hide under a tarp and wait for the rain to cease. And then, finally, we started to descend and could enjoy sporadical views of Paramillo del Quindio. Because views were limited, we couldn't see Tolima Peak at this time. Our highest point of this day was 4200 meters, and we slept in farm El Berlin, situated 3700 meters above sea level. This is the best procedure for how to acclimatize properly. Always sleep lower than was your highest point of the day. The second hike was also 10 km long, we arrived in El Berlin around 3 PM and had enough time to regenerate because we had a long day ahead of us. Later, we again gathered in the kitchen, shared our stories with fellow travelers and went to bed quite early. The third day was the longest one when it came to a distance. After we set off, the trail led on the flat path at first, then we climbed a bit and then we descended down to the small mountain community, from there, we had to climb up again to gain the elevation and after an hour or so, we emerged on a beautiful Paramo plateau, with many frailejones plants and differently colored flowers. But another highlight, Laguna Otun, was still ahead of us. The biggest lake in the park which has glacier origin lies 3900 meters above sea level, but we were overlooking it from the path in 4100 meters, which was also the highest point of the day. We could also see Nevado Santa Isabel's south face, the volcano we were about to climb on the next day. After lunch, the walk to Potosi was an easy one, the only difficulty was our increasing weariness. Luckily, the Potosi farm was nearby and mostly downhill, we only had to register in the park office and then, we went to a farm, where we had a very short rest ahead of us. We spent the rest of the day in the kitchen, where we played cards with our fellow travelers and tried not to think much about the next day. After dinner, we had a brief talk about what to expect, and what to take with us for the next day climb, and then we went to bed for only a few hours. The last day of the whole hike and the most anticipated (and for someone the most feared) day has come. We were woken up at 2:30 AM, had a quick breakfast, packed the gear and jumped on the jeep. The drive itself should've taken about 40 minutes, but we were so sleepy, that we didn't track the time at all. When we arrived at a parking lot we left some stuff in the car and accompanied only by lights of our head torches, we started our hike up to the glacier. It was dark, and we stopped regularly to eat some snacks and to drink water. The path to the glacier is 4 km long with a slope of 1000 meters, and considering the early hours, we still wonder anyway, how we arrived near the glacier soon after dawn. When we came to the glacier base, everything happened very quickly and efficiently. We put on crampons, gaiters, axes, helmets, had a quick chocolate snack, were divided into two groups, tied by a rope to our guide who went first and set off. To be honest, the climb was eventually much easier than (at least I) expected. Nevado Santa Isabel is a perfect glacier for beginners because it is not technical, and the hardest part would probably have been the last 50 meters, but due to bad weather (we walked in the cloud all the time), we did not do this last section. After we shortly, but intensively celebrated our success (almost) on the top in 5050 meters, we got a chocolate with a personal message (ate it right away) and set off to descend. The ascent took us about an hour, and we were down at the glacier base within 40 minutes. Here, we took off all the gear and returned the same way to the car which was waiting for us in the parking lot. On the way back, we could finally admire views which were before hidden in the dark. Clouds lifted up for a while, the sun started to shine, and we couldn't ask for a better way how to finish our four-day hike through Los Nevados National Park. When we came back to the car, we only quickly changed into dry clothes, and our driver took us back to Manizales. We also had lunch somewhere in the middle between Los Nevados and Manizales, the place was called La Laguna, and the trout we had here was the best we've eaten in Colombia for sure. When we arrived in Manizales, first we stopped at the bus station, where we picked up our stuff we did not need for the trek (Paramo Trek agency sent it on our behalf from Salento to Manizales) and then the driver dropped us off in our hostel in Manizales. It was a long and demanding day, and overall after four-day hiking in Los Nevados, we were quite tired, but couldn't stop thinking about the perfect adventure we just finished and although the day after we felt absolutely useless, we knew for sure that this was one of the best treks we ever did and our number one trek we did in Colombia. Our Travel Tip: For the day after the trek, plan an easy and relaxing day in Manizales. Trekking through Paramo and mountains in Los Nevados National Natural Park was one of the hardest but the most stunning at the same time we've ever done. The diversity of this place is incredible and the combination of the trekking in high altitude, mountains, sleeping at the farms with locals, the adrenaline climb to the volcano and the perfect organization from Paramo Trek side, made those four days simply unforgettable. From now on visiting Los Nevados National Natural Park is unquestionably on the top of our list of places we've visited in Colombia, although we have never expected it. There can be only one advice from us given to you: don't hesitate and try this trek (or another one) in Los Nevados National Park, it will be something you will remember forever. Because the trek starts in Salento and ends in Manizales (although you can travel with guides back to Salento), it is wise to book your accommodation to make sure, especially, after the trek that you will have a place with a nice comfy bed and hot shower secured. In Salento, we stayed in Hostal Vista Hermosa, a newly renovated family-run hotel and in Manizales, we found our base in Golden Frog Mountain Hostel, our favorite accommodation in Colombia. This post was written in collaboration with Paramo Trek. As always, all opinions are our own. For information about the park or trails, check Paramo Trek Website. To make a reservation or ask any question you have, fill out this contact form or send them an email directly.